This is a freeze dried mixed blend culture containing Penicillium Roqueforti AND Aromatic Mesophilic. So you no longer need to purchase Penicillum Roqueforti and Aromatic Mesophilic seperately. 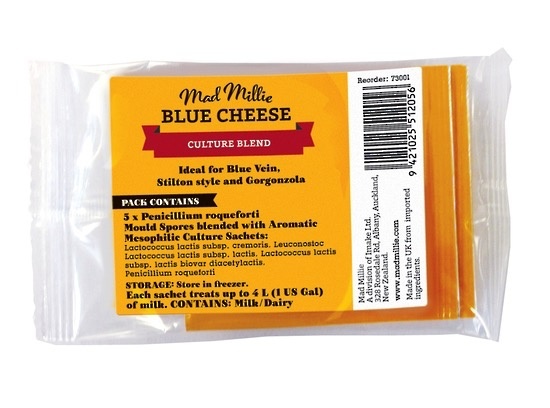 Penicillium Roqueforti (VZ3) is an important ingredient in the production of blue cheese. It is a dried, powdered conidia produced from the fungus Penicillium roqueforti and is responsible for the blue mould which appears in your cheese. Aromatic Mesophilic (YV32) is essential in creating the creaminess and buttery flavour in the cheese. Strains included in this culture are: Penicillum roqueforti Lactococcus lactis subsp. cremoris Lactococcus lactis subsp. lactis Lactococcus lactis subsp. lactis biovar diacetylactis Leuconostoc Pack contains 5 sachets. Each sachet doses 4L of milk. Shelf life is 12 months when stored in the freezer. These mould spores last out of the freezer (at room temperature) for 2 months so will be fine during postage. However, we suggest storing them in the freezer as soon as you get them in order to prolong their life.